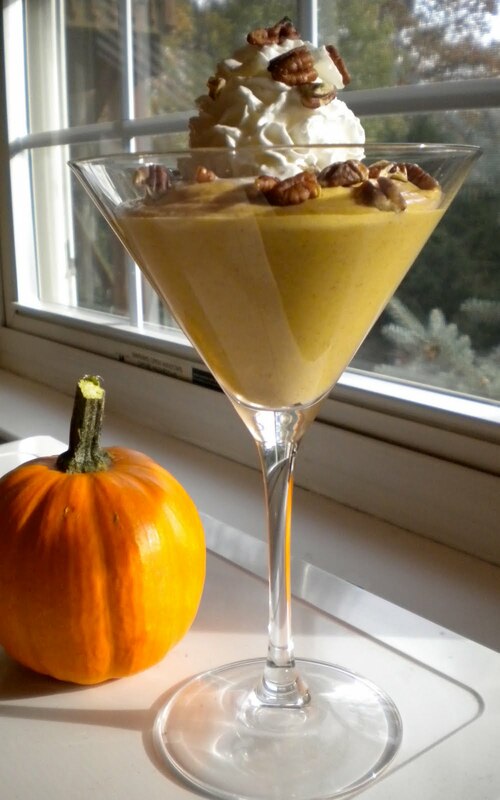 Diet It Up: “Squash” those holiday calories with Pumpkin Pudding! “Squash” those holiday calories with Pumpkin Pudding! I love all things pumpkin. Too bad 99% of those things are dessert. Man, I’m a sucker for dessert! Over the weekend, I tried my best to create a Diet It Up worthy Light Pumpkin Pie. Unfortunately, my efforts failed miserably. Light pie crust is an oxymoron. Butter and flour join forces to make pie crust a tender, flaky experience. Whole wheat flour and margarine do not. So, where does that leave me? I want some pumpkin pie! My second thought was to make a pumpkin mousse. But what makes up the base of a delicious mousse? Heavy Cream. Foiled again! I decided to experiment with a PUMPKIN PUDDING. Don’t let the name fool you. This is much fancier than those pre-portioned diet pudding cups at the supermarket. I made the mistake of trying Jello’s Mousse Temptations once. Never again. So, the dessert starts with fat-free, sugar-free vanilla pudding. I make it slightly less fat-free by preparing the pudding with 1% milk to give the finished product a little body. 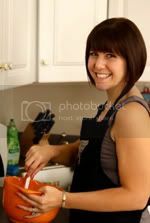 I stir in a can of pure pumpkin, spice it up with your classic pumpkin pie spice, a little honey for some sweetness, fold in Lite Cool Whip and bingo, bango, a delicious pumpkin dessert. Let’s chat about pumpkin pie spice for one second. Don’t buy it. It’s silly. I’m taking a tip from Alton Brown here and not spending my hard earned bucks on something that is NOT a valuable multi-tasker. Mix together 1 tsp cinnamon, ¼ tsp nutmeg, ¼ tsp ginger and 1/8 tsp cloves. Keep the mixture on hand and measure it out according to the recipe you’re using. This way you don’t end up with a jar of spice that will make 30 pumpkin pies and you can use the individual spices for other culinary masterpieces. I spooned the pudding into some martini glasses for a little added fanciness. I topped the glasses with Reddi Wip. I happen to think Cool Whip tastes pretty funky. I only use it for texture and prefer real whipped cream if I’m going to really taste it. A little garnish of toasted pecans gave the dessert a much needed crunch. I hate to toot my own horn (who am I kidding, of course I do! ), but I kind of loved this. It’s really light. It tastes like pumpkin pie, but you don’t have to skip a meal to have enough calories in your day to enjoy it. Plus, it looks festive enough to put on the Thanksgiving table. Pumpkin pie, you’ve been dethroned! I made this last night and it was delicious. Only change we made was we subbed the honey for Grade B Maple Syrup. Tastes like pumpkin pie in a glass. I just love this recipe. Even though it is long past pumpkin dessert season, I still make this recipe at least once a month. I use Jello's sugar-free cheesecake pudding packets rather than the vanilla ones, which I heartily recommend to all cheesecake fans out there. Thanks for a fabulous healthy dessert recipe, Trish!